United States President George W Bush arrived in India on Wednesday evening for a three-day visit that is expected to take the Indo-US relationship to new heights. 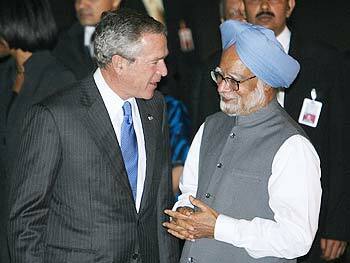 Breaking protocol, Prime Minister Manmohan Singh personally received President Bush and wife Laura at the Indira Gandhi International Airport in Delhi. From the airport, Bush drove down to Maurya Sheraton Hotel, which has been completed taken over by the US security detail for Bush's maiden visit to South Asia.